If you need a reminder as to how the scrolling behaves in Flappy Bird then take a look at the final version of our clone. We’ll use the flappy.fla file that you worked on in part two. If you haven’t attempted the first two parts of the tutorial and would rather skip the design stage and jump straight into development, then simply head over to GitHub and get the latest version of the FLA. In part two we previewed our finished artwork in the browser using Animate CC’s default publish settings. For many situations these settings will be fine but for this tutorial we’d like our Flappy Bird clone to scale-up to fit the browser window and also resize in response to changes in the window’s width and height. All of this can be done from the Publish Settings panel. Figure 1. Responsive Publish Settings. Firstly, we’d like our game to vertically and horizontally centre align with the browser window, so check the Centre Stage checkbox and also select Both from the dropdown box next to it. Next, click the Make responsive checkbox. Since we want our game to resize whenever the browser’s width or height is changed, select Both from the dropdown box associated with the checkbox. Also check the Scale to fill visible area checkbox. Now we need to decide how scaling of our viewport will be handled within the browser. We have two options. We can ensure that our game’s entire viewport is always visible, which may result in visible border spaces surrounding it. Or we can scale the viewport to cover the entire screen but at the risk of some of the viewport being cropped. For our game it’s best if the entire viewport is always visible so select Fit in view from the dropdown box to the right of the Scale to fill visible area checkbox. Use Figure 1 above to verify that you have the correct settings then click OK to close the Publish Settings panel. Now let’s test our changes in the browser to see exactly what our publish settings are doing for us. Remember, at the end of part two we had to temporarily guide out the Screen Flash layer before testing. Do the same again here then select Control | Test Movie | In Browser (Cmd-Enter | Ctrl-Enter) from Adobe Animate CC’s dropdown menu. You’ll see that your game’s viewport now consumes all of the browser’s vertical screen space. Adjust the width and height of the browser window. The game’s viewport will adjust to fit the new window size and also maintain its aspect ratio. Congratulations! Your content is now fully responsive. Move back to Animate CC and un-guide your Screen Flash layer again, then save your FLA. While it’s perfectly possible to write code externally using an editor of your choosing, we’ll write all our code within Animate CC. We’ll do this by adding scripts to our FLA’s timeline. Figure 2. The timeline, stage and Actions panel. The method doesn’t do much at the moment. It simply writes some text to the browser’s console. If you remember from the first part of this tutorial, we set our document’s frame rate to 60 fps. Therefore our update() method will get called, and will write text to the console, 60 times per second. If you aren’t familiar with Object-Oriented programming techniques then don’t worry. We’ll keep things straightforward enough that you’ll still be able to follow along. Think of our update() method as the game’s heartbeat. All the game’s logic will eventually be run from here and will be continuously executed during the game’s lifetime within the browser. Let’s go ahead and test the code we have so far. 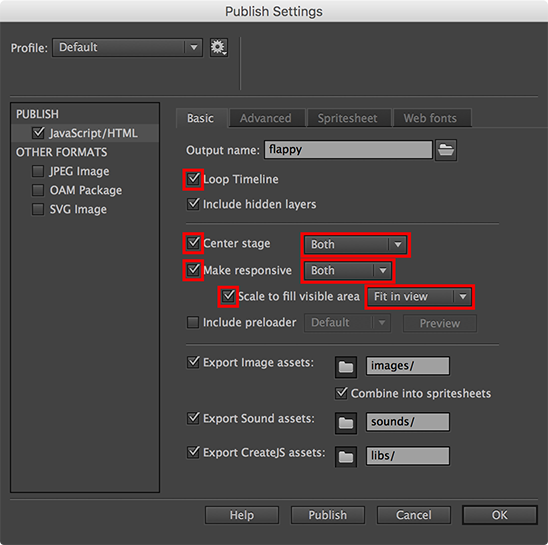 Republish your FLA by selecting File | Publish (Alt + Shift + F12 | Ctrl + Shift + F12) from Animate CC’s dropdown menu. Now refresh your browser to load and run the latest version of your game. Figure 3. The console window. The above line, simply gets a reference to our screen flash movie-clip and hides it from view. exportRoot is a special global variable that is made available to you. It represents your stage and all the content within it. If you think back to part two, you should remember that we assigned an instance name of screenFlash to the movie-clip that represents the screen flash. We can access that movie-clip via the exportRoot object. In fact, we can do this for any display object within the stage that has an instance name assigned to it. Once we have referenced the screen flash, we can then work with the various properties and methods associated with it. In this case, we want to set its visible property to false in order to hide it. For example, the EaselJS library – which is a part of the CreateJS suite – provides a MovieClip class. We’re just after using the MovieClip class to set the visibility of our Screen Flash movie-clip. It provides many properties and methods that are similar to the ActionScript 3 equivalent. You can find the CreateJS API reference for MovieClip along with other classes which we’ll use throughout this tutorial here: www.createjs.com/docs/easeljs/modules/EaselJS.html. You can also find code examples and reference material for the entire CreateJS suite on the site’s official homepage: www.createjs.com. Save your changes and republish. Refresh the browser and you should now see the contents of your stage. The screen flash should be hidden along with various other UI elements. As well as making the bird flap its wings, the userPressed() method will be responsible for starting a new game. When a game begins, the ground layer and pipes will start scrolling. When the game is over, the ground and pipes will stop scrolling. We’ll concentrate on the ground layer for the remainder of this tutorial. We’ll create a class named Ground to handle the logic for it. Just like our Main class, this class will have a constructor used to initialise it and an update() method that acts as its heartbeat. Before we begin, let’s pin our Main class to the Actions panel. Pinning allows us to quickly move between each of our classes within the Actions panel as we work. Figure 4. Pinning your script to the Actions panel. Ensure the Actions panel is visible. If it’s not then find the Main class layer on the timeline. If you look at the first frame you’ll see that it has an icon indicating that your code is attached to it (Figure 4). Click on the frame then open the Actions panel by selecting Windows | Actions (F9) from Animate CC’s dropdown menu. We’ll do the same for our Ground class when we start writing it. 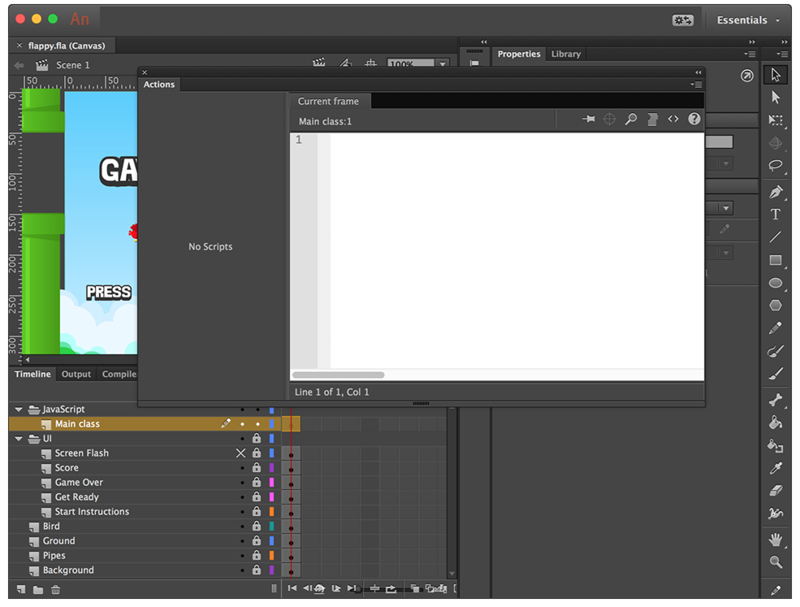 Within Animate CC, create a new layer directly above the Main class layer. Name the layer Ground class and click on its first timeline frame which is where we’ll add the code. If the Actions panel isn’t visible then select Window | Actions (F9) from the dropdown menu. Within the Actions panel, click on the Current frame tab, which is the tab to the left of your Main class tab. You’ll be presented with an empty script window. Pin this window by clicking the Pin Script button. A new tab will be created named Ground class, which is where we’ll write our code. At the moment our Ground class won’t do much other than write some text to the console whenever scrolling is taking place. Shortly we’ll start adding code to actually deal with the movie-clips within our stage that represent the ground layer. But first let’s wire-up the Ground class to our Main class. Our Ground class’ update() method currently isn’t being called anywhere. We’ll fix that by calling it from within the Main class’ own update() method. 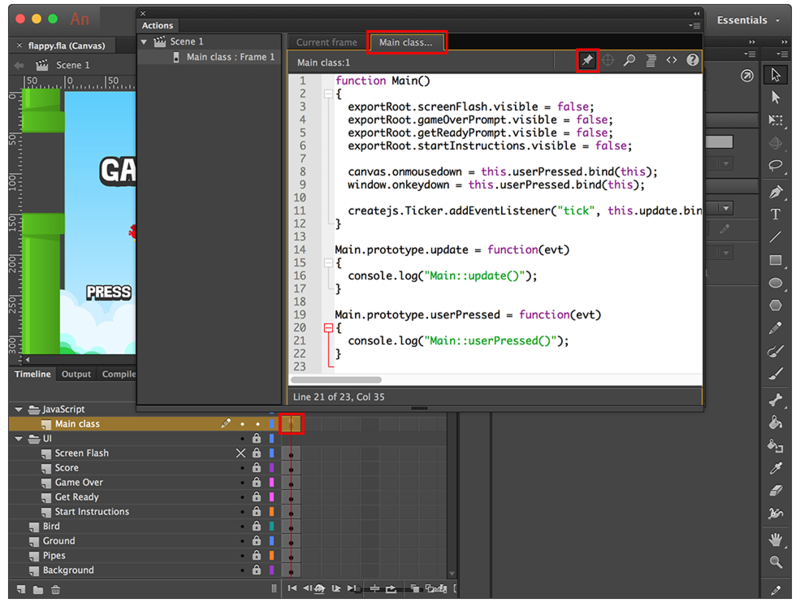 Within the Actions panel, click on the Main class tab to view its code. Now all that’s left to do is to trigger the scrolling of the ground when the user interacts with the game. Add a new method named startGame() and call it from your userPressed() method. Also remove the log() statement that’s within your userPressed() method. Now republish and test your changes within the browser. If you can see this then your code is working as expected. Okay, now that we have the Ground class wired up to our Main class, we can go ahead and start working with the actual movie-clip instances that represent the ground. If you unlock the timeline’s Ground layer and take a look at the stage, you’ll see that we have three movie-clips named ground0, ground1, and ground2. Each of these clips represent a vertical ground slice and are sitting adjacent to one another to create the ground layer. Remember, we can take advantage of the global exportRoot variable to access any display objects on our stage. Let’s write some code within our Ground class’ constructor to store all three ground slices within an array. We’ve stored each of our ground slices within an array named slices. We have declared this array as a member variable, which allows us to easily access the ground slices within any method in our class. The order of the array’s elements is important. Each slice is stored in the array based on its position relative to the screen’s left-hand side. The slice at the front of the array is the closest to the screen’s left while the slice at the end of the array is the farthest away. This ordering will come into play soon. The updateSlicePositions() method is fairly straightforward. A for-loop is used to walk through our slices array and pick out each of the ground slice movie-clips. The x-position of each movie-clip is then moved to the left slightly. A constant named SCROLL_SPEED is used to specify the number of pixels to move each of the slices by. That constant belongs to the Main class and will also be used to move the game’s pipes when we eventually get onto them. It hasn’t yet been added so let’s do that now. We’ve assigned a value of 3.0 to the SCROLL_SPEED constant meaning that each of the ground slices will be moved to the left by 3 pixels every time the stage is redrawn. Let’s test what we have so far. Save your changes and republish. Now refresh your browser and click anywhere on the screen. The ground layer will start scrolling and eventually disappear out of the left-hand side of the screen. This is a definite step in the right direction but to create endless scrolling we need our ground slices to wrap back around and re-appear from the screen’s right-hand side. Let’s go ahead and write some code to do that. Move back to Animate CC. We’ll need to know when a ground slice has fully left the screen. We can determine this by checking to see if a slice has moved beyond a certain x-position. To work out what that x-position is we’ll first need to discover the width of our ground slices. We can determine the width by simply measuring the distance between the position of the first and second ground slice. As you can see, we’ve stored the width in a member variable named sliceWidth. This will allow us to easily access the width throughout the class. As you can see from the above code, we’ve stored that value within a member variable named leftBound so that we can easily access it elsewhere within the class. Let’s examine our method in a bit more detail to better understand how it works. Let’s try out our latest changes. Save your FLA then re-publish. Refresh your browser and click anywhere on the game’s viewport. You’ll see the ground layer scrolling indefinitely. Each slice will re-appear from the right-hand side of the screen after it has scrolled out of the left. Congratulations! We have an endless scrolling ground layer. Now that scrolling for the ground layer is up and running it won’t be that difficult to get the game’s pipes scrolling too. However, I’ll let you digest what’s been covered today and we’ll tackle the pipes in part four. See you then.